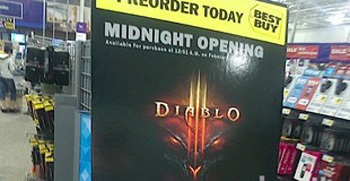 According to Best Buy, Diablo 3 will hit shelves on February 1st. At least according to the picture on the right, which was taken in the Best Buy store in Rochester, Minnesota. The tweet that contained the image has since been pulled, but the folks over at Joystiq managed to snag the image before it went down. A Best Buy employee confirmed that the display is real, and that as far as she knows, the game is set for a midnight launch on February 1st. Best Buy's web store also confirms the date. There's been no word from Blizzard as of yet. Another gamer spotted a similar advertisement in Gameplay, a UK-retailer, which shows a February 3, 2012 release date. Delays are, unfortunately, common when it comes to European releases of international titles. That being said, Blizzard has stated they were planning a region free, simultaneous launch for Diablo 3. If these signs are legit, that leaves little time for Blizzard to deal with the problems they're having getting the game past South Korea's Game Rating Board. Update: Wail and lament, gentle readers. The date is false, according to a tweet from Blizzard community manager Micah Whipple. Also, eagle eyed reader Coldie has noticed that whoever made the sign managed to spell February wrong. Hmm.